We like to use this blog to answer common magnetic questions in a bit more detail. Here we can provide a fuller explanation than might be possible in an email or brief conversation. It’s also nice to share this kind of stuff online so people can find it for themselves while searching! I’m measuring the Surface Field of a specific magnet with magnetometer, and I’m measuring less than the specified Surface Field. Why are my readings low? Is something wrong with the magnet? Let's dig down into the details and see how these measurements can be useful. We'll also learn about what their limitations and pitfalls might be. What exactly is a Surface Field? It’s a property we list for many magnets. It is the theoretical, calculated field strength you might expect to find right at the surface of the magnet, expressed in gauss. If you prefer tesla, 1 tesla = 10,000 gauss. Consider the D82, a grade N42, ½” diameter x 1/8” thick disc magnet. 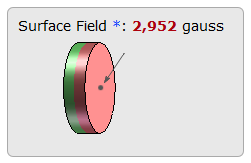 The listed Surface Field is 2,952 gauss. You can calculate this number yourself using the formula found in our Surface Fields article. Our Pull Force Calculator does the math for you using the same formula. 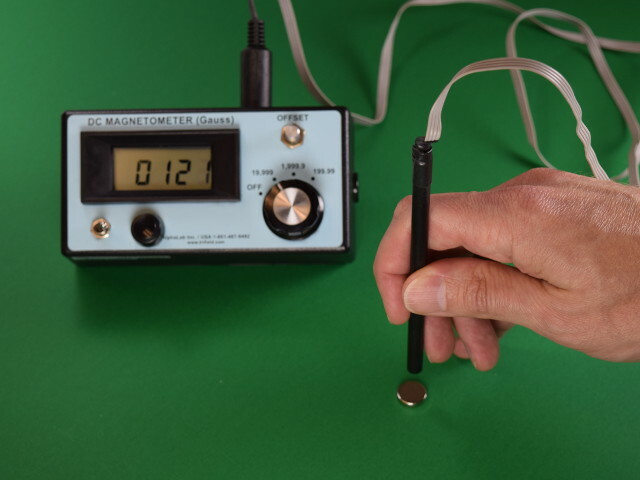 A DC magnetometer is an instrument that measures magnetic field strength. It is also called a gaussmeter. 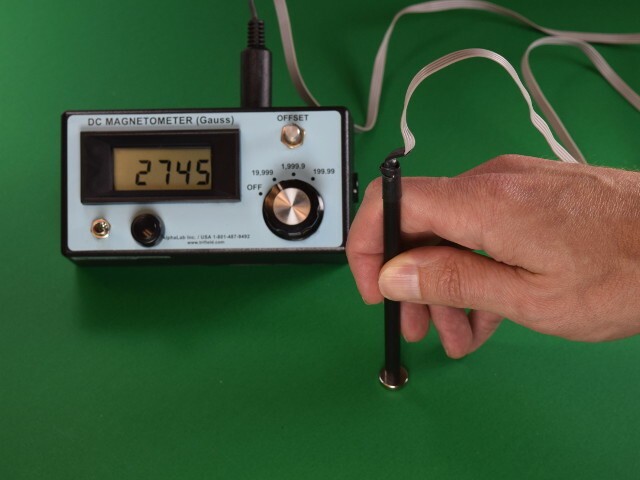 http://www.trifield.com/content/dc-gaussmeter-model-gm1-st/: An updated version of the one shown here. http://www.lakeshore.com/products/Gaussmeters/Pages/Gaussmeter-Models.aspx: Their model 410 is a simple, single-axis product similar in function to the one we’re using. In all of these examples, the device consists of a box of electronics with a display, and a measurement probe that’s connected via a cord. You’re measuring the field strength in a single direction (single axis) at a location around the tip of that probe. The probes come in two main types: axial and transverse. The long, black, pencil-sized cylinder you see in the photos is an axial probe. It measures the field strength only in the direction of the long axis of the cylinder. Transverse probes are the opposite, because they measure the field strength perpendicular to the probe. 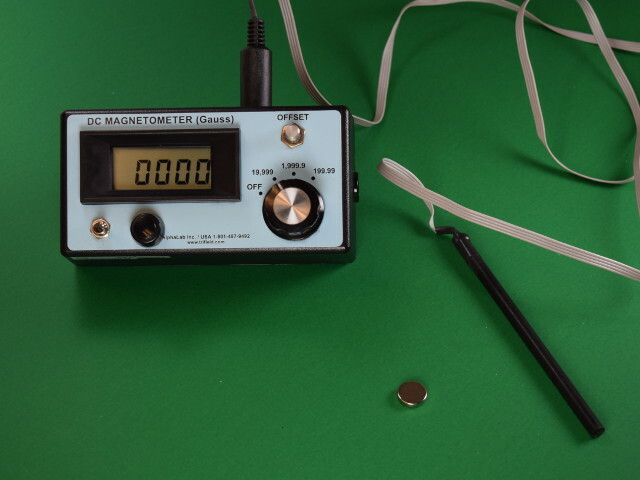 For those who like to build their own electronic devices, be sure to check out our article about how to Make a Magnetometer. It's simplistic and a bit more limited in function, but offers an idea of how you can make a magnetic field measurements with a few electronic components you might even have around. Your measurement probe doesn't measure field strength right at its surface -- it's offset a small amount. When you press the measurement probe up against the surface of that D82 disc magnet, you expect to see the Surface Field number. In practice, you see a number that’s quite a bit lower. Why is this so? The primary cause is the measurement probe. It doesn’t actually measure the field strength right at its surface. The part that does the sensing is some small distance inside the probe. We’re actually measuring the field strength at some small distance from the surface of the magnet. The probe we’re using here has a measurement area that’s offset beneath the surface by about 0.035”. That's about 1/32 of an inch, or almost 1mm. This distance varies depending on the make and model of the probe you have, but there’s always some small gap. Let's consider what that theoretical equation predicts. When we measure a D82 disc magnet from 0.035” away with our magnetometer probe, the calculated, theoretical result should be about 2,643 gauss. Compared with a listed Surface Field of 2,952 gauss, that’s a whopping 10% less. That’s a lot when you normally think about magnets as having a tolerance of just a few percent. How much error should you expect from this? It depends on the size of the magnet. When measuring really big magnets, the small distance difference caused by the probe doesn’t matter much. If the magnet is very small, the errors can be quite large. Below is a list of a few cylinder magnets along with the expected error from such a measurement. While we do sometimes make unofficial measurements of a magnet with a magnetometer to check its strength, our rule of thumb is that it’s just too inaccurate for magnets smaller than about ¼”. Temperature: Since Br varies with temperature, a warmer magnet will provide a weaker field than a cooler one. Expect field strength to drop just like Br, about 0.12% per °C. That’s not a lot, but it might make readings in summer perhaps 1% less than readings in winter. Distance tolerance: Depending on how robust and repeatable your test setup, the actual position of the probe might vary a little bit. Just one piece of office paper between the probe and the magnet could drop a reading by over 1%. This doesn't matter much when measuring large magnets. When measuring tiny magnets, tiny movements can be the dominant error. Offset tolerance: All of this theoretical discussion so far assumes we’re measuring the field strength right above the center of the magnet. If our measurement is offset to one side, this can alter the results. This could be from the tolerance of us positioning the probe imperfectly with respect to the magnet. Part can be the imperfections of the internal structure of the probe. Depending on the size and shape of the magnet, this might add or subtract from the field strength we measure. Actual tolerance of magnets: For a given batch of magnets, there will be some normal variation of their strength. This should vary with Br, the residual flux density. On our Specs page, there are limits set for each grade. It works out to a variation of a few percent. In practice, the actual variation you see can be slightly larger than these numbers suggest. Why? While weak magnets are rejected during normal quality control checks, magnets that are slightly above spec are often approved as OK. If we have a batch of grade N42 magnets and a few measure a bit stronger, like you might expect from “N43” (if that were such a thing), they’re considered OK. Magnetic imperfections: Neodymium magnets aren’t a perfectly homogenous material like the theoretical formula assumes. As described in our article All About Magnetization, it’s actually a grainy structure with lots of nooks and crannies. If you measure a few hundred points around a given magnet, you’ll find slight variation in the actual magnetic field strength and direction compared to a theoretical model. This kind of error or variation seems to show up more with thinner magnet shapes. A not equal to B: There’s a tendency of some magnets, especially in thinner shapes, to show different field strength on different sides. This is frustrating when you’re expecting a specific field strength based on theory, but seems to be a normal result with sintered neodymium magnets. It’s true for most to some degree, but more noticeable with very thin magnets. If using this sort of measurement as a quality check, consider averaging these two readings. How else can magnets be measured? To make a quality control check of a magnet’s strength, field strength measurements with a magnetometer aren't the most accurate answer. It’s a great rough estimate that can be done with modestly priced instruments -- certainly better than nothing. For more precise measurements, especially with smaller magnets, we use an altogether different method. 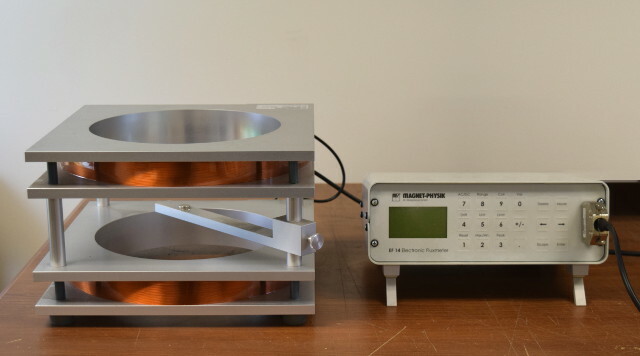 We use a setup consisting of Helmholtz coils and a fluxmeter. Helmholtz coils are two coils of insulated wire with many turns, sized and spaced apart in a specific way. Hooked up to a fluxmeter, it’s a sensitive instrument. Changes in the magnetic field inside these coils induce an electrical current in the wires, which can be measured. This correlates directly to the magnetic moment of the magnet itself. The process is simple. A magnet is placed in the center of the coils and then flipped 180°. 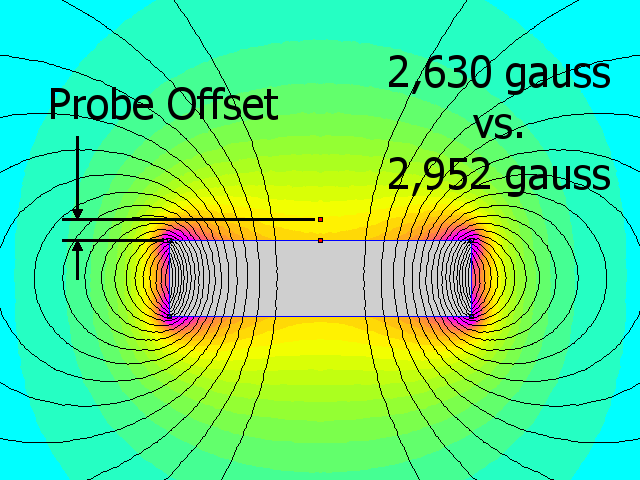 This change in the magnetic field induces a tiny current of electricity in the coils of wire. The stronger the magnet, the more current it induces. With careful measurements and a bit of math, that current can be correlated to the magnetic moment -- the torque a magnet feels in the presense of a magnetic field. Huh? The torque a magnet feels in the presence of a magnetic field? What does that mean? It sounds like a lot of jargon. Is there a more down-to-earth explanation? Think of a compass needle. A compass needle is essentially a long, thin magnet. In the presence of a magnetic field, a torque (twisting force) pushes that needle to point north. How much torque does it feel in the earth's 0.5 gauss field? That force is directly related to the strength of the magnet. The stronger the magnet, the more torque. This torque is what we're measuring with this setup.